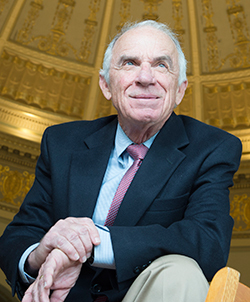 Known for his books chronicling Dallas history and the people who shaped it, journalist and historian Darwin Payne ’68 will be honored as the seventh annual Literati Award recipient at Tables of Content on April 30. According to Robert Bucker, ’81, assistant to the vice president for strategic affairs at SMU, “The Second Century Celebration Organizing Committee, chaired by SMU Trustees Ruth Altshuler and Carl Sewell, asked DeGolyer Library to commission an independent and scholarly centennial history to coincide with the commemoration. Darwin was chosen among other candidates because he is a highly regarded former SMU faculty member, historian and author of several books on the history of Dallas and its citizens. “Funds for the five-year appointment of a centennial historian and the publication and distribution of the book were provided by the committee and by Hoblitzelle Foundation of Dallas,” he adds. Payne, who taught at SMU for more than 30 years and is professor emeritus of communications, enjoyed a storied career in journalism before joining the University. He has written biographies of J. Erik Jonsson (DeGolyer Library, 2014) and other newsmakers. His other titles include a groundbreaking history of the civil rights movement in Dallas and a history of SMU Athletics. Payne has spent the last five years focusing on a topic that is close to his heart: SMU. In 100 Years on the Hilltop: The Centennial History of Southern Methodist University, he paints a portrait of an institution that has lived up to the bold vision of its founders to become one of the nation’s top universities. He will sign copies of the book, published by DeGolyer Library, at the Fondren Library open house on April 15. While researching the project, Payne set up an office in DeGolyer Library to be near the SMU Archives. Working closely with SMU Archivist Joan Gosnell, he mined a trove of historical materials collected over a century, including the papers of administrators and faculty members, minutes from the meetings of the board of trustees, annual reports, yearbooks, student newspapers, magazine articles, news releases, academic catalogs, and various other documents and secondary sources. He also had access to oral history interviews and conducted many of his own interviews.